On April 26, I will be presenting a one-day workshop on oil pastel at Opus in Coquitlam, which will include a demonstration followed by hands-on practice for participants. This coming Summer I will be teaching a nature sketching class at Century House. This will consist of both in-class instruction and outdoor practice. Details will be listed on the Century House Summer brochure, which will be published in June. Outside of teaching, I am still working to overcome concussion symptoms by gradually increasing my time at the eisel. I am continuing to practice watercolour, pen and ink, and zen doodle, and am rediscovering acrylic. I look forward to more plein air sessions as the weather warms up. My watercolour painting Hummingbird With Cactus will be in the upcoming “Aquarelle et pastel” art show at the Federation Gallery on Granville Island April 17-29. I will also be participating in the “Limitless” art show June 3 – August 4 at the Anvil Centre in New Westminster, along with other local artists. This entry was posted in Uncategorized on April 2, 2018 by Peri Nilan. I will be participating in the New Westminster Cultural Crawl at the Anvil Centre (777 Columbia St). Select work from members of the New West Artists will be on display from from 10am to 5pm on August 12th and 13th. I will have both watercolour paintings and zen doodle artwork on display. The originals will be available for sale, as well as prints and cards. I will also have “Deco-Doodle” zen doodle artwork on display at Art Squared, held August 28th to September 4th, at The Gallery at Queen’s Park. For more information about these events, please visit the website. This entry was posted in Uncategorized on August 9, 2017 by Peri Nilan. After an extensive absence from the art world to recover from a severe concussion, I am slowly returning to my artwork. I stayed in touch with the art community by participating in a handful of local shows in New Westminster since last summer. On days when I am feeling better, I have been practicing my Zen doodles and am looking forward to being published in the magazine Zen Doodle Workshop this Spring. Hopefully, I will be well enough by the Fall to start teaching classes again! This entry was posted in Uncategorized on April 11, 2016 by Peri Nilan. Summer has flown by and it’s been a busy one. We had a fun time in Santa Fe and Taos, New Mexico, where the landscape, indigenous culture and local arts scene inspires many artists and artisans. We visited numerous galleries and spoke to many local artists, took lots of photos of the scenery and watched the variety of birds from our hosts’ front porch. We also enjoyed a glorious week camping at Quadra Island late July. I managed to include some sketching time while at the campsite, and when picnicking at the winery on the south end of the island. We did some kayaking, short bike rides, and of course, lounging on the beach. I completed a commissioned pen & ink drawing, part of a fundraising event that took place in early July, and then had some fun experimenting with Zentangle® drawing using pen & ink then adding colour with layered coloured pencils. This entry was posted in Uncategorized on August 6, 2014 by Peri Nilan. The New Westminster Artists will have a tent set up in Uptown New Westminster after the Hyack parade is finished. 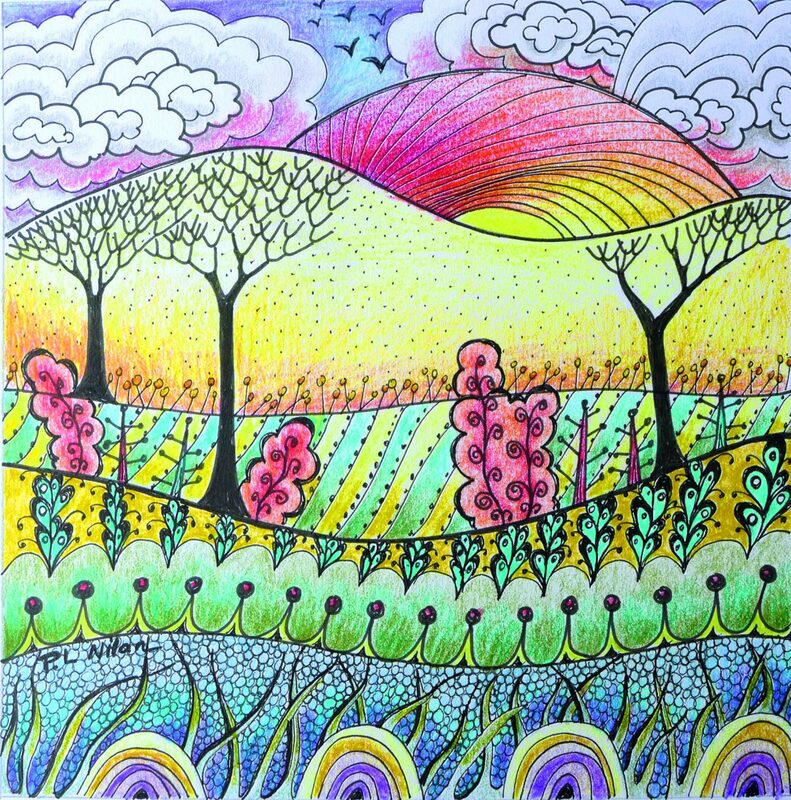 I will be selling cards with my artwork – come and visit! The annual Heritage Home Tour explores the Royal City’s finest heritage homes. I have been a regular participant in the creation of the tour booklet, donating numerous pen and ink drawings of local houses over the years. You can see many of these in my Pen & Ink gallery. This year, my drawings include famous landmarks such as Irving House and Knox Presbyterian Church. This entry was posted in Artwork, Event, Heritage House Tour and tagged art cards, Heritage Home Tour, Hyack Festival, New Westminster on May 12, 2013 by Peri Nilan.